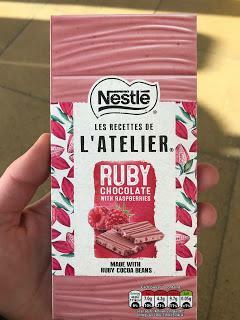 After hearing about this new Ruby Chocolate with Raspberries from the Nestle L'Atelier range it was one I just had to hunt down. I enjoyed the Prestat Ruby bar from last year and was hoping this might be just as good. In addition to Ruby Chocolate it also contains raspberries to take the fruitiness up an extra notch! Described as "couverture chocolate with freeze dried raspberry pieces" it contains 48% cocoa solids, and comes in a 100g slab. There's sections that can be broken off as shown above. 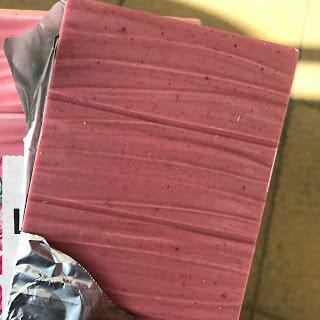 The bar is quite thin, but the raspberry pieces are still clearly visible within the chocolate. Even though I went into this expecting something similar to the Prestat Ruby bar, I should have known it wouldn't be quite the same. 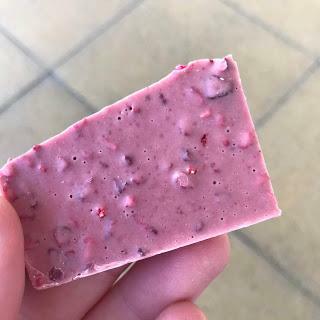 This is more of a traditional Raspberry flavoured white chocolate than Ruby, I honestly couldn't taste much of the Ruby cocoa at all. It tasted like a good quality white chocolate but with a strong berry flavour. 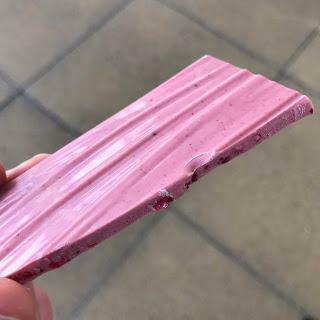 Now Ruby chocolate does have that kind of flavour anyway but there was no "distinct" taste of it here, at least to my tastebuds. Maybe it was a mistake to use such tart fruit as raspberries to combine with this, since they dominate all other flavours in the bar. All in all, I did enjoy this, it's certainly fun to have pink chocolate and it does taste good...but it's not quite as "wow" or exciting as I'd hoped. I also don't think the regular price of £3.50 can be justified at all, since it's essentially glorified white chocolate with raspberries. Have you tried this bar? Have you seen it locally? Let me know in the comments!